As we approach the end of this mayoral election, it’s tough to think beyond the polls, the final interviews, and the constituent handshakes in the rush to the finish. But in the coming days, your attention will turn to the work at hand—finding solutions to the many challenges facing Chicagoans today. From the headlines directly into our neighborhoods, Chicago’s problems often fall hardest on our city’s youth. And perhaps no single issue impacts our young people more than gun violence. On March 12, we lost yet another bright, young teen to this epidemic—a young lady full of potential and dreams for her future. After school that day, 18-year-old Dareyona Smith was walking with a friend in Auburn-Gresham when she was struck in the chest with a bullet from a drive-by shooting. A senior at Ralph Ellison High School, Dareyona participated in one of my organization’s sports refereeing programs throughout her high school years and was planning to graduate this spring. Her family and her community are left reeling. Sadly, this story is all too common. There is no easy solution, but we know we must do better by our children. Perhaps one approach—one I believe in from decades working in education and youth development, and that Mayor Emanuel prioritized through initiatives like One Summer Chicago and the expansion of Becoming A Man—is to identify creative ways to support and mentor youth, breaking down the barriers that lead to tragic outcomes. Sometimes, it’s in the unexpected approaches that give space for major changes in our neighborhoods. For instance, it’s no secret police-youth interactions can be enormously challenging, and far too often lead to heartbreak. To help change these outcomes, we partnered with the Chicago Police Department to run five programs last summer led by a CPD Officer—a detail not revealed to the teens until well after their program started and relationships were formed with the instructor. 110 teens traveled from 35 communities—largely under-resourced neighborhoods—to participate in programs that focused on STEM, arts, sports, or leadership and addressed topics related to policing. At the end of the program, participants had built unexpected bonds with the officers, reporting it changed their views. Youth shared that the experience helped them see officers as individuals with families and interests outside their job, and helped teens have greater respect for and comfort around police. Another group making change is the Peace Warriors from North Lawndale College Prep. These motivated teens have each made a commitment to a life of nonviolence, encourage others to do the same, provide support to students who have lost loved ones to gun violence, and are gaining national recognition for their movement. This is what Chicago looks like at our very best. Of course, no organization or civic leader can do this alone. At this critical time in our city’s history, we must work harder—together—to show young people every day what Chicago looks like on its best day. So much progress has been made, and the current administration elevated youth enrichment programming to a level never before seen in Chicago. But our city, and our teens, are counting on you to continue this progress—to drive new initiatives and unexpected opportunities that will set up Chicago’s next generation to be in a better position than they are today. We have great hope for the future of Chicago. We look forward to partnering with you and hundreds more youth-serving organizations to make this city a place where our children can grow up to thrive. 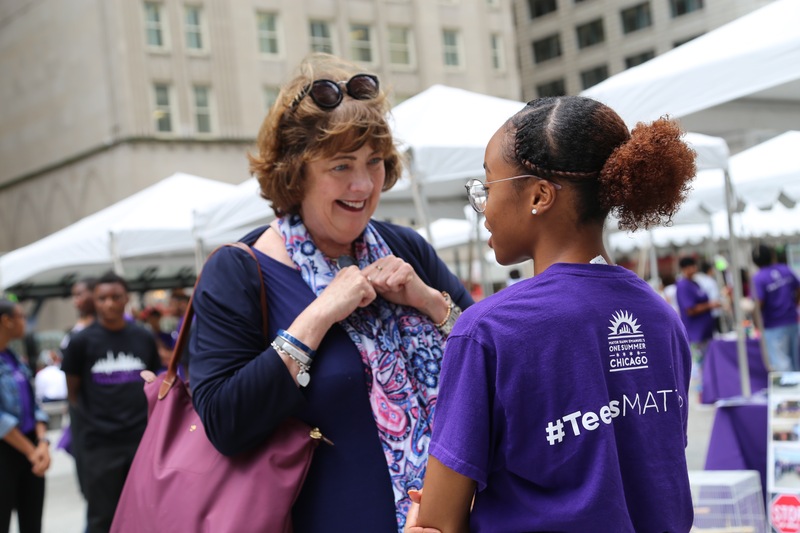 Mary Ellen Caron serves as chief executive officer of After School Matters, a nonprofit organization providing Chicago high school teens with high quality, out-of-school time opportunities to explore and develop their talents while gaining critical skills for work, college and beyond.